A series of banner ads produced in conjunction with a direct mail campaign, fulfillment kit and website. I was responsible for developing and executing the look and feel of the campaign as well as designing and producing these banner ads. 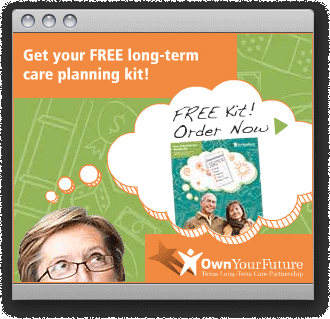 The ads ran on a wide variety of websites to help give an extremely top-line idea of what Long-Term Care insurance is and encourage them to click over to the website to learn more and download a PDF of the fulfillment kit. Each direction was adapted to three sizes each and translated into Spanish. 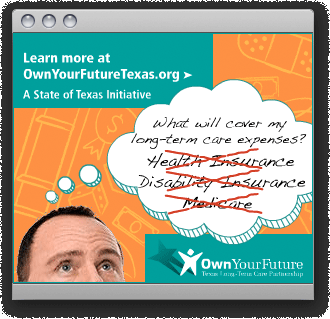 Click on each ad to launch the animated version.